If you’re an Android household you probably are familiar with making a Google Family so that apps purchased by parental unit A can be enjoyed by Parent B, child A, B, C, etc. It also allows everyone to access purchased movies, stream music through Google’s music service, and now it adds a shared calendar. 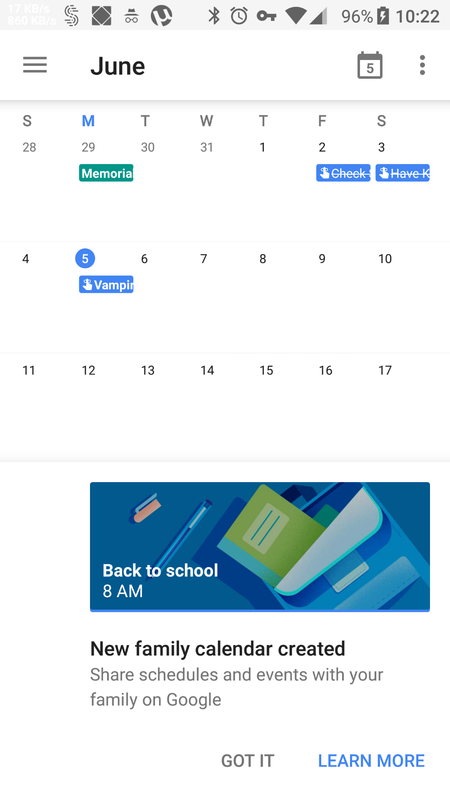 If you’ve already got a Google Family set up and accounts associated with it, just go into Google Calendar and you’ll see a calendar listed as “Family”. Things added to this show across all family member’s calendars, but they don’t have access to your personal calendars where you and the spouse have scheduled a trip to Chuck-E-Cheese’s without the kids. Google Keep has added family to the collaborators. Assuming you’ve got Google Family set up create a note or drawing, then tap the three dots in the bottom right, collaborator should pop up, you can add family from there. If you haven’t set up a Google Family yet, just click this link and you’ll be sharing purchased items, media, calendar events, doodles in Keep, etc. The other person in your family will require a Google account, and will be sent an email asking if they want to be a family member. The most useful thing I think I’ve run across with Family is that although you don’t have to have a subscription to their music and video offerings (Google Play Music, YouTube Red,) if you do everyone has it up to a certain point. Should be noted that since a person has to have a Google account, it appears you’ll need to be over 12 years old to share content. Overall it’s such an obviously needed update I have to wonder why it hasn’t been around for a long time. Combine this with Google Location Sharing and you’ve got a lot of beautiful tools to help with managing a herd of nerf herders.